In 2016 as a result of our strategic planning process, the inaugural School of Engineering Faculty and Staff Vision Awards were presented. The awards recognized the innovation, creativity, entrepreneurial thinking and outstanding performance of our faculty and staff for their work as it relates to our School's values of community, innovation, excellence, engagement and service. Four Vision Awards are presented annually: Community, Innovation, Excellence, and Engagement and Service. The awardees receive a plaque and a monetary award in the amount of $2000. Professor Chuck Edmonson received the 2016 Vision Award for Community for his long-standing commitment and work toward a more diverse and inclusive School of Engineering community. 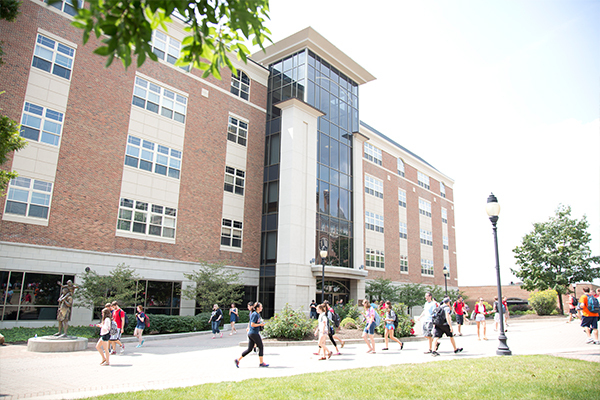 In 1993, Prof. Edmonson helped to establish the University of Dayton Minority Engineering Program framework and responsibilities, which still exists today within the School’s Diversity Engineering Center. During this same time period, he served as the Director of the Pre-Engineering Program, which partnered with Dayton Public Schools to provide special STEM (science, technology, engineering and mathematics) training and exposure to high school students. For the past 25 years, Prof. Edmonson actively participated and supported the School's Women Engineering Program for female engineering students on campus as well as the Women in Engineering Summer Camp for high school female students interested in engineering, which he still does today. In addition, he continues to support a more inclusive student population, including adult, non-traditional students who transfer to the University. The groundwork for a more diverse and inclusive student population at the School of Engineering was laid and continues to evolve because of the efforts of Prof. Edmonson. Dr. David Myszka received the 2016 Vision Award for Innovation for his long-standing record of teaching excellence in the Department of Mechanical and Aerospace Engineering (MEE) and the Department of Engineering Management, Systems, and Technology. Most recently, Dr. Myszka served as the principal instructor in Experimentation and was instrumental in the revision of mechanical engineering's computer design course sequence. Since then, numerous students have benefited from the dramatic improvements that resulted from his revisions. Across the mechanical system curriculum, Dr. Myszka continues to teach multiple courses at multiple levels, from undergraduate to graduate students. His teaching evaluations have been significantly above average, including scores of 5.0 out of 5.0, in every mechanical engineering undergraduate and graduate course that he has taught. Outside of the classroom, Dr. Myszka provides significant experiential learning opportunities for students through the Design of Innovative Machines Lab by involving over 40 undergraduate students in the last five years in various research activities. Dr. Kristen Comfort received the 2016 Vision Award for Excellence to recognize her achievements in excellence as an early career faculty member in bioengineering scholarship and in engineering education. This year alone, Dr. Comfort published four papers in peer-reviewed journals, with another one in review, presented at nine national conferences, and received funding in excess of $220,000 from numerous sources, including the Air Force Research Lab (AFRL) and the Kern Entrepreneurial Engineering Network (KEEN). In addition, she has submitted five research proposals, which are currently under review. Dr. Comfort continues to excel in scholarship, while carrying heavy loads in teaching and service and serving as the director of bioengineering for the Department of Chemical and Materials Engineering. Ms. Julie Brill received the 2016 Vision Award for Engagement and Service for her actions that go above and beyond the expectation of her job responsibilities as Senior Administrative Assistant in the Diversity in Engineering Center (DEC). Consistently, Ms. Brill brings new ideas to the forefront that aid in the mission of the DEC. She is reflective about her vocation and how it impacts our students and community. She actively seeks educational opportunities to better serve our engineering community of students, staff and faculty. Annually, she attends conferences on counseling and returns with current best practices to assist the University and the School of Engineering. Beyond engineering, Ms. Brill positively effects the University and the School through her service as a conduct adviser for the Office of the Dean of Students, an advocate for Green Dot, and as a member of the Hay Reclassification Committee and the Mental Health and Suicide Prevention team for the Office of the Dean of Students. University of Dayton chemical engineering alumnus Zach McHale won first place and $25,000 for his stadium seat device in the University of Dayton?s 11th annual Flyer Pitch competition, one of the largest collegiate-level business plan contests in the country. Two years ago, while laying on a beach in Belize, senior mechanical engineering technology major, Gonzalo Perez, had an idea for a ?rescue robot? to help extinguish fires.